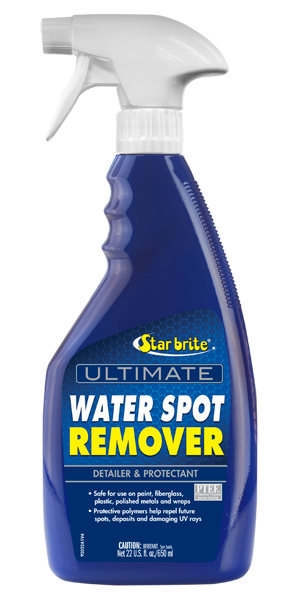 Star brite Ultimate Water Spot Remover is the easiest yet most effective way to remove water spots. 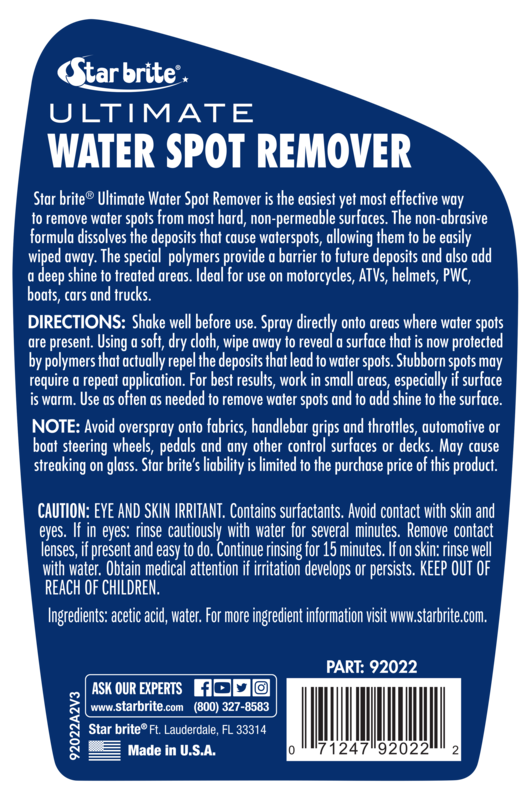 The non-abrasive formula dissolves the deposits that cause waterspots, allowing them to be easily wiped away. The special PTEF® polymers provide a barrier to future deposits and also add a deep shine to treated surfaces. Ideal for use on motorcycles, ATVs, helmets, windshields, PWC, boats, cars and trucks. Shake well before use. Spray directly onto areas where water spots are present. Using a soft, dry cloth, wipe away to reveal a cleaned surface that is now protected by polymers that actually repel the deposits that lead to water spots. Stubborn spots may require a repeat application. For best results, work in small areas, especially if surface is warm. Use as often as needed to remove water spots and to add shine to the surface. NOTE: Avoid overspray onto fabrics, handlebar grips and throttles, automotive or boat steering wheels, pedals and any other control surfaces or decks. May cause streaking on glass. Star brite’s liability is limited to the purchase price of this product.